One of the best experiences I had last year was when I was invited as a lead pacer for a half marathon event, 2:30 pace group, during the first Quezon City International Marathon (QCIM). Overall, I was happy how that experience turned out. I was deeply thankful of my fellow pacers, Ebong and Gab aka Rastaman, for a job well done. No amount of money could replaced the exhilaration I felt after knowing those who finished in our pace group felt so elated with their experience as finishers of the half marathon event. 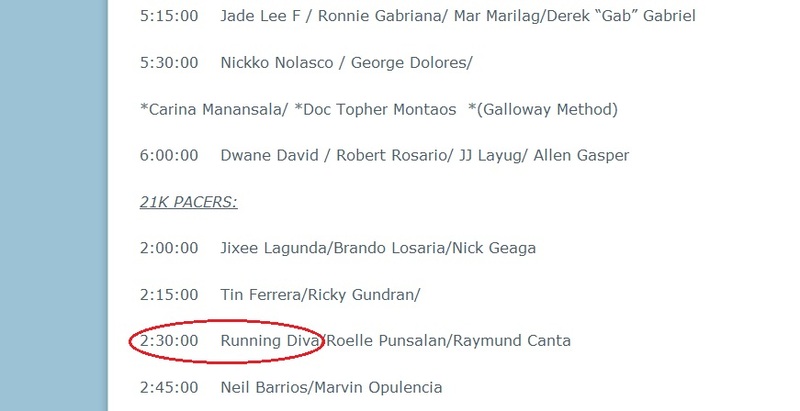 This year, Running Diva returns by running in the same pace group of 2:30 (in hours). Finishing a half marathon within two hours and thirty minutes is neither slow nor a fast pace group. Below is the list of pacers taken from Sir Rene’s aka Jazzrunner‘s blog. I found this article in my blog archive, October 2009, and decided to have it reposted here as you may have missed reading this before. How glad I was to read some articles about perfect pacing experience. I got these DOs and DON’Ts guide from Runner’s World magazine. Having the perfect pacing experience depends on who’s leading the way, of course; but you also bear some responsibility to yourself, to the leader, and to the rest of your group. Do make sure you’re in the right place. It means you know your time goal. If it’s too fast for you then opt for the slower one. Let’s accept it. There are just some runners who want to show to the world how fit they are by running ahead. Bad move. If you want to lead the pack, then leave the pack. This one I like. This defends my case (as I’m not much of a talker during races). Some groups are quiet, others chatty. Same goes for the leader-some will offer encouragement, others focus quietly. Nothing wrong with the friendly “how you feeling?”-but don’t become a Blowhard Bob, meaning, a braggart or a boaster. Don’t expect the pack to cater to your needs; but if you have to stop, don’t panic. Take care of your business, then take your time catching up to your group. Do give the leader space. No need for me to explain it, right? Why is an even or negative-split pace works better? Firstly, it gives our body time for a good warm up by preparing the muscles for the activity. Just like how you start your car efficiently. Once your muscles are ready, you can maintain the same pace or increase it with not much effort. It’s also important to avoid being pulled by fast runners that you become one of them at the start. Remember, a fast start means a significant decrease of performance as you go back. To some running a certain distance may come as a piece of cake but that is totally different to most who are either running a half or full marathon for the first time. Over lunch today a friend of mine, an experienced runner, even said, “two more weeks and it’s full marathon for me!” and it was followed by a long sigh. See? Even an experienced runner do feel anxious. Just like you and me. Why is this so? May be because we are not so sure of the outcome. Okay so you’ve been training hard. Sometimes struggling. At other times succeeding but the whole time it’s in your head. “Am I really ready for it?” “What am I getting myself into?” “I didn’t have much time for training.” Do you think I can do it?” May be these are some of the questions playing in your mind. It’s all there in your head. But mind you even experienced runners are probably thinking the same way many times over especially that race day is fast coming. What I am trying to say here is that we all have goals. Mine right now is to lead runners across the finish line and at the same time achieving their target time goal of 2:30 (in hours). How about you? Marathon is competitive that’s why it’s called a race. So you want to race, eh? If you think you are then my next question would be, “Are you ready or still feeling a bit nervous?” They say if you are feeling this pre-race anxiety, it only means one thing. You are just mentally and physically preparing yourself for the race. The ultimate test is race day itself. Ey, no worries, OK? You’ve been training hard for this. Why worry? To conquer fear is to embrace itself. Go back to your goal and focus. Be realistic with your goal. Focus is the main ingredient towards a successful marathon. Just like any event there are just things that are beyond our control. If things don’t happen the way you want it to be, don’t be disappointed. Instead prepare yourself for it. Don’t forget to relax and have some fun while running. Being too serious ruins the experience. Remember you’re already a winner by signing up for a race. I didn’t have any inkling that the incognito and fellow pacer, Ebong, was the one and the same classmate of mine at the Mizuno running clinic. What a surprise! And take note of the runners behind us, the funny musketeers Erick a.k.a. Shocks 5, DocT a.k.a. Doc Tapiok, and Crash Burn. Running event is a male dominated arena but I could say that women empowerment is truly alive in this country. If you try to see the pacers group photo below, you would notice that there were only two female pacers, Running Diva and Carina a.k.a. the Flying Boar. And, I would like to personally mention here Jonel a.k.a. Bugobugo85 who warmly welcomed me on stage. Super thanks for that gesture Jonel. Same goes to Runnex for the opportunity and for the vote of confidence bestowed on us. The surprise of my life didn’t stop from coming. Right after the introduction of the pacers, a young and bubbly guy approached me for a photo op. And it was Mark. Mark left some comments on my blog before and I was humbled that he appreciated the articles I posted here. I was so glad to finally meet him in person. Rene a.k.a. Jazzrunner told me already that I might be asked to sing during the CLP but I didn’t take it seriously as I knew he was only jesting. But, again I was caught off guard when suddenly I heard my name being called to perform on stage. Ey, am just a regular girl who enjoys music and singing and did some concerts in my own bathroom! I had no choice but to go up there. While singing, I saw my takbo.ph friends did photo ops with the Kenyan runners. I so wanted to just stop singing but I had to finish the song. The night ended with funny poses with takbo.ph friends. They are not only a bunch of running addicts but also young at heart fellas. They love to kid around. Just look at the guys on Row 3. What do you think? Sunday: The Day Has Finally Come! Woke up at 3AM for this event. A great task at hand! Today I will be in a race not to race but to pace fellow runners who wanted to finish their half-marathon in two hours and thirty minutes. These were my thoughts while I was preparing my stuff. What’s so touching about being a lead pacer is to be with fellow pacers who believe in your capacity. With that said, I was grateful to be with Gab and Ebong, my fellow pacers and co-leaders who believe I can. Super duper thanks guys! Those were the balloons for the 21k pacers. The half-marathon race started at the QC Circle at exactly 5AM. I didn’t have any idea who were following me but I could sense there was a good number of runners in our pace group. They were chatty and energetic. Fast running friends whizzed by and shouted jokingly at me, “Running Diva you need to talk and prep them up!” I just acknowledged their shout with a chuckle. Our pace group started by running an even pace of more or less 7 min./km up to the first turn around point near Batasan Hills. After the turn around point, it was then where I slightly increased the pace, took no notice of the Garmin watch for some minutes and never realized I was running a bit too fast until Ebong gently tapped me on the shoulder reminding me to slow down a bit. Whew! We were averaging a pace of 7.01/km. But I wanted to bring the group at an earlier time than the targeted finishing time. I maintained instead a pace of 6.57/km all throughout except on the last two kilometers. I slowed down a bit knowing that we had ample time to finish the race. One of the veteran runners said to me, “It’s an overshoot finish.” I wondered what he meant by that. I later realized that the group would reach the finish line six or four minutes earlier than the targeted time. That would mean a strong finish for everybody in the pace group. A few meters left before reaching the finish line, I shouted to the group, “It was an honor to bring you to the finish line today fellow runners. Thank you so much!” True enough, we reached the finished line clocking 2:27.57 with seconds ticking. Jubilant, we gave each other some high-fives, we shook hands, and tapped each other’s shoulders. No amount of words can describe what I’ve felt and experienced that day. Photo 1 ~ Bloggers meet and the banner says it all. Can you see me? Photo 2 ~ Pre-race shot with fellow 21k pacers with our balloons. Photo 4 ~ With Margalicious still and Marvin Rae. Photo 5 ~ With Armie, Runnex Secretariat, who knew me through my blog. Thank you Armie for your appreciation. Photo 7 ~ With takbo.ph friends and fellow 21k pacers. Photo 8 ~ With James, so happy to finish his first full marathon. Niel a.k.a. Crash Burn and I went back to pace/walk with James. Niel didn’t get to join us in this photo as he had to drive and park his car to the Circle. Leading the pack of half-marathon runners? This is the same question I’ve been asking myself countless of times ever since I accepted the challenge to be one of the official pacers for the 1st Quezon City International Marathon. Not an easy feat considering that it will be my first time to be a pacer in a race. But there is no turning back now as it is a privilege and an honor to bring you fellow runners to the finish line, of course; with the help of Gab as co-leader. I did my first half-marathon last year during the Adidas King of the Road race with Wilbert at my side while running along with Bobby and Sensei John T. It was a no-fuss-run, meaning, to just finish the whole stretch of the half-marathon. It was just us. No pacer. Pacers lead runners across the finish line, target the overall group goal and not the personal goal, and look out for the welfare of all. A pacer is a leader, coach, cheerleader, psychiatrist, etc. To be a pace-group leader in the upcoming QCIM half-marathon next weekend is quite a big responsibility. My only concern though is how can I be an effective cheerleader of the group when I, myself, is not a talker while running? How glad I was to read some articles about perfect pacing experience. I got these DOs and DON’Ts guide from Runner’s World magazine. This one I like. This defends my case. Some groups are quiet, others chatty. Same goes for the leader-some will offer encouragement, others focus quietly. Nothing wrong with the friendly “how you feeling?”-but don’t become a Blowhard Bob. Over lunch today a friend of mine, an experienced runner, even said, “two more weeks and it’s full marathon for me!” and it was followed by a long sigh. See? Even an experienced runner do feel anxious. Just like you and me. Why is this so? May be because we are not so sure of the outcome. Okay so you’ve been training hard. Sometimes struggling. At other times succeeding but the whole time it’s in your head. “Am I really ready for it?” “What am I getting myself into?” “I didn’t have much time for training.” Do you think I can do it?” May be these are some of the questions playing in your mind. It’s all there in your head. But mind you even experienced runners are probably thinking the same way many times over especially that race day is fast coming. Thankful that Supertyphoon “Pepeng” (international name: Parma) cut across northern Luzon with little damage, I joined the QCIM long slow distance or LSD last Sunday, Oct. 4. I arrived at the University of the Philippines (UP) Oblation, the assembly area, at ten minutes before 4:30AM. More than 60 runners joined in this simulation run. (I was just a tiny yellow orange speck in the crowd). We took off 15 minutes later under a very light shower of rain. First pit stop was at Shell station along Commonwealth Avenue. The group then turned right going to Batasan Hills up to the 21k turnaround point. Instead of going back to UP, I decided to run with the group and see La Mesa Eco Park. The photo below was the second pit stop of the group before proceeding to the Eco Park. For the full marathon runners, here are some of the photos of the QCIM route, courtesy of Running Pinoy and Run Unlimited. Prepare your hamstrings as you run this “not-so-steep-hill”. The road leads you to the Eco Park. On the right of the photo, partly hidden by coconut trees, is La Mesa Dam. Nice road, nice environ, cool place to run, right? We waited a bit for the management to allow us to see the reservoir but even if we had permit to enter the place, we were constrained not to for safety reasons. Instead the group had another photo op, ran the Fairview route to make up for the supposed mileage, and decided to save the best for last. See you at the starting line!